Moringa powder is completely considered a super food because it is rich in nutrients. Originally from South Asia, it can also be found in the tropics. By its antioxidant properties, this plant is three times stronger than the chokeberry. It is used in the treatment of high blood pressure, anaemia, colitis, osteoporosis, diabetes, impotence, and premature aging. Moringa powder has a greenish colour and successfully regulates blood cholesterol and glucose levels. It causes general interest for quite legitimate reasons, and it adopted the name “green gold”. For the health-conscious people, who want to maintain good general condition of the body system - this plant is certainly the right choice. Moringa tree is native to India, Pakistan, Afghanistan, Bangladesh and the foothills of the Himalayan Mountains. Today, the plant is spread over the subtropical region all the way to Africa, Asia, Hawaii and Thailand. Specifically it thrives in all parts of the world where it is warmer than 0 degrees. This plant is called the Tree of Life. Most suitable to it is the temperature over 10 degrees C. It tolerates drought, but moisture and cold do not suit it. Otherwise it is appreciated as the most nutritious plant that is so far known to mankind. Because of its green gold Moringa powder, it is rightly considered super food. Moringa oil is applied in cosmetics, as anti-inflammatory and regenerative product. For a plant that is certainly an incredible potential! Unfortunately Moringa cultivation is almost impossible in some areas, because this tropical plant does not tolerate temperatures below 5 degrees. Then it freezes it cannot be recovered. It is a difficult plant to cultivate, it needs a warm sandy soil, which is not too moist, as the root will rot. What is the composition of the Moringa plant? Moringa powder is not a new found magical spice, but was used in Ayurveda medicine for almost 4000 years. It was used in almost 300 different medical conditions and diseases, therefore the plant is widespread. In the west it was used since the 70s of the last century, and increasingly people look for moringa powder, oil and tea. Especially interesting is the fact that in recent years a number of water projects spread awareness of this plant on the African continent. In fact, it thrives on a completely barren land, has an extremely high number of nutrients - about 90 major and over 500 total. Moringa plant is rich in vitamins A, B1, B2, B3, B5, B6, B7, B9, B12, C, D, E and K. In addition, it is rich in calcium, chromium, copper, fluoride, iron, manganese, magnesium, phosphorus, potassium, sodium, selenium, and zinc. Contains valuable amino acids, such as isoleucine, leucine, lysine, methionine, phenylalanine, threonine, tryptophan, and valine. The best ally of the immune system, because it improves circulation, regulates blood sugar levels and metabolism. In addition to its composition proteins are found in a high percentage of over 20 percent. There are also valuable vegetable fibers, hlorofil- which is found almost four times more than in wheat grass. All these nutrients are contained in moringa powder in very high amounts, and have a very good combination with other nutrients. Moringa plant has 25 times the amount of iron than spinach, and significantly fewer undesirable oxalate, and the absorption of minerals is a lot easier. This is why this plant is special and is considered the queen of super foods and it is know that it is much more nutritious than hemp, baobab. The leaves are the most nutritious part of the plant, and from it we get a famous moringa green powder. It is an excellent source of protein, B-complex vitamins, vitamin C and K, as well as beta-carotene. In the West, the Moringa powder was used as a dietary supplement, and in developing countries - as a means of solving problems with malnutrition. Since it contains polyphenols and carotenoids, moringa capsules help prevent heart disease. An Indian study showed that regular intake of pills with extract of Moringa contributes to lower levels of bad cholesterol (LDL), as well as increasing levels of good cholesterol (HDL). 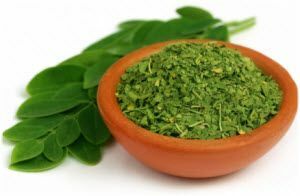 In Asia, moringa powder is traditionally used in therapy for diabetes, because the extract of this plant can lower the glucose level in the blood after a meal. Another study of Philippine experts noted that moringa tea really lowers blood glucose levels in people who have problems with glycaemic control. Moringa plant is a rich source of phenolic and flavonoid antioxidants, which are anticancer chemicals, including chromogenic acid, quercetin and rutin. The studies confirmed that Moringa extract may protect DNA from damage that increase the risk of cancer. Moringa powder is a strong antibacterial agent. Pasta made from powder of these plants can equally clean hands contaminated with the bacteria that cause diarrhoea. It can destroy and prevent the spread of E. coli and salmonella. Judging by the results of the Thai study, the extract can destroy the virus that causes cold sores on the lips (herpes simplex type 1). Moringa powder is as effective as an anti-viral medication -acyclovir ointment. Several studies confirmed that plant moringa heals stomach ulcers, which are usually caused by Helicobacter. Moringa powder is a more powerful antioxidant than aronia, acai and Godzi berries, and is appreciated in the phytotherapy. The plant itself is good for problems with night blindness, because it has among other things a lot of vitamin A. Simply put, it is very difficult to say what the moringa plant has in its composition. To set the task before the scientists to draw up an ideal plant - it would most definitely look like a moringa plant. Moringa powder is obtained by drying the leaves of the plant, in the form of supplements, of sourly taste and can be added to various dishes or water and beverages. However, it should not be heated, it is not added to warm drinks - because it destroys its nutrients. Just pour boiling water over the leaves and later add a scoop of local honey. Moringa tea that already contains spices is more appreciated because it is tastier, and a larger quantity of green tea is added to it, and you get an exceptional antioxidant combination. Moringa powder is a true super food that contains a large number of nutrients, and anyone can take it. In addition it can be used to clean as a beverage or with any natural squeezed juices, smoothies, or meals. It is generally not recommended for cooking, due to the loss of certain nutrients, but who needs iron it is convenient to cook it then. Always observe the specific manufacturer's instructions for each preparation. As with the operation of any supplement, the results are not instantaneous, but are exhibited over a specified time of continuous use. Children older than 12 months and adults (healthy) people can take a teaspoon of powder during the day, diluted in a cup of lukewarm water. If you are pregnant, breast-feeding, chronically sick, do not take moringa powder before consulting with your doctor. We are stating this purely as a precaution, because so far not one contraindication was reported to this product. Add it to the nutrient drink of fresh fruits or vegetables in order to increase the protein content and antioxidants. Add it in a warm broth (not hot). If you do not like the taste of moringa powder, add into it the natural squeezed orange juice. Preparations that are with us are represented as: oil, soap, and tea and moringa powder. The oil that is produced from the seeds, is very appreciated in cosmetics, and is thought to be even better than the famous Argan oil. It is used for skin care, but also for certain health problems. It is edible, because it contains a lot of nutrients, but in the first place it is intended for skin care. It is easily absorbed has an excellent proportion of omega 3, 6 and 9 fatty acids. Shelf life of Moringa oil is over 5 years. It was used in ancient Egypt in the time of Cleopatra, as this was confirmed by dates in which it was found in, whose age was thousands of years old. It is good for virtually all skin problems: eczema, wrinkles, wounds and cuts. It penetrates the skin quickly and significantly speeds up the healing of wounds. It can also be used for hair because it is not greasy, and gives a great shine. The skin of the scalp very quickly absorbs it, and the hair becomes soft and silky. In fact for less skin problems this plant is exceptional, although the people use it to cure serious cuts. How do you make soap from Moringa? Moringa soap is made by combining oil in equal proportions with olive oil, and it is very good for the hands skin and face. It is very pleasant, excellent moisturizer and leaves the skin moist. It is completely natural, smells good and does not contain any aggressive substances that damage the skin. For full skin care it is best to use first soap and then Moringa oil. There's nothing I have not used for recovery of the scalp and always seemed to me that it was the same. With hair dying I started as a teenager and that was the source of all my problems with the decline. Already with 23 years my hair is considerably thinned and became visibly dry on the tops. A friend of mine recommended the moringa oil for hair and I got it immediately. I use it for 11 months and I am very happy. My hair is thick again, great (not greasy) and very soft to the touch. Wholeheartedly recommend it! Catherine, aged 24. I use moringa powder for 6 months and have no more problems with the stomach acid. Two years ago I was diagnosed with chronic gastritis, which was caused by helicobacter. I went on a strict diet regime, so as not to let the disease get complicated and lead to ulcers. I managed to some extent to deal with heartburn, until I got the "green gold". I apply a simple recipe, dilute a teaspoon of Moringa in a glass of lukewarm water and drink it in the mornings. I have no further gastric interferences. Dusan, 42 years. I drink orange juice with Moringa for several months. It helped me with problems with insomnia. It is easier to fall asleep now and I wake up as a new man. Things extremely irritated me before, such as public transport, which is 15 meters away from me, now it no longer bothers me. I recommend moringa powder, but I heard it was equally good in a tea blend - and I have to try it. Lazar, retired 66 years. Although 2 -3 years ago, powder, tea and oil could only be ordered through eBay in some parts of the world, today you can buy it in all capitals. Any better equipped herbal pharmacy has these preparations. Price of moringa powder packing of 100 grams is 10 to 12 dollars, and if you buy it in larger quantities, it is quite favourable. The product can be purchased online via the Internet. Be sure to buy only organic moringa powder, from a known certified manufacturer, so you do not get the "green gold" of dubious origins. Unfortunately scams are common, not only for this product. How these are absolutely natural products of exceptional plants, so far adverse effects and contraindications have not been noticed. Pregnant women and nursing mothers are still recommend to consult with a physician before use. In addition to the moringa powder and oil being used in cosmetics and medicinal purposes, you can include it in the daily menu: Use oil for salads because it has a very pleasant mild-nutty taste. Moringa seed is an extremely powerful detoxifier and it is used for water purification. One seed that weighs about 100mg and it can purify a litre of fluid within an hour. Thus, for example, from river water that is murky, you can get a completely physically, chemically and biologically clean water. We believe that moringa powder interested you, there is a reason it is called green gold.